Toxic tweets that led to the dismissal of pianist Valentina Lisitsa from Toronto orchestra are causing understandable outrage. But for someone reading Russian and Ukrainian posts on daily basis, her language comes across as standard, if not mild. This is exactly how pro-Kremlin and pro-Ukrainian bloggers address each other on social networks 24 hours a day. I once translated a post by Russian fascist Aleksandr Dugin who called Ukrainians “a nation of bastards that emerged from sewage manholes”. It was retweeted by hundreds of people, which came as no surprise. Apart from Dugin, I also tweeted some excerpts from the prominent Ukrainian blogger Serhiy Ivanov. Although his statements were arguably even more extreme than Dugin’s, they didn’t draw nearly as much attention. This is fair enough – Russia has invaded Ukraine and the world’s sympathies lie with the Ukrainians. Dugin is not exactly mainstream in Russia and has almost no access to TV, even though his Eurasianism seems to have been taken on board by the Kremlin. By contrast, Ivanov, who has 34,000 followers and friends on Facebook is the Ukrainian TV darling, a famous columnist, a close friend of top politicians and a co-founder of a non-parliamentary party. Ivanov is a former prosecutor and a refugee from Luhansk region, which is often cited as an excuse for his inflammatory language. From my observation, he’s been recently avoiding blatantly hateful speech, but he remains a leading trend setter and many young bloggers copycat him. 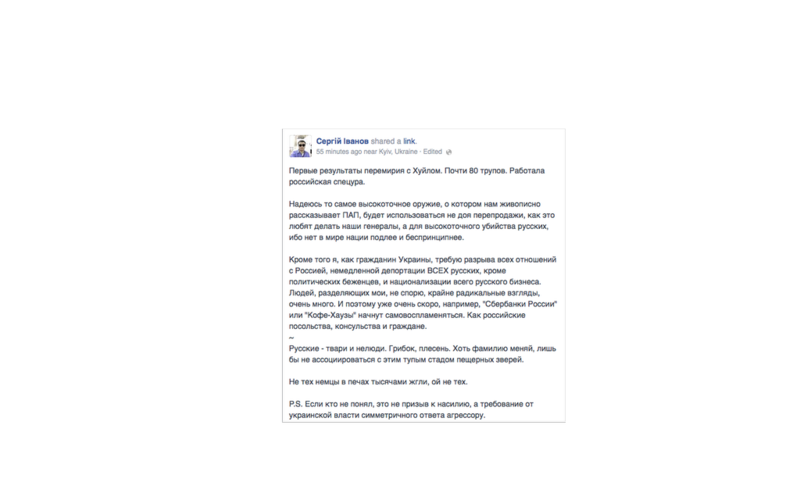 Here is the translation of his most outrageous post published in the early September 2014. He has by now blocked access to all posts that appeared before October, but I’ve got a screenshot, which I tweeted at the time. “First results of ceasefire with the Prick [Putin]. Almost 80 dead. Russian special forces’ work. I hope these high-precision weapons PAP [Poroshenko] has been bragging about will not be resold, as our generals love to do, but they will be used for high-precision killing of Russians [uses the word referring to ethnicity, not nationality], since no nation is more vile and unsrupulous than this one. Besides, as a citizen of Ukraine, I demand that all relations with Russia should be broken, all Russians [ethnic term again], except political refugees, should be deported, all Russian-owned businesses should be nationalized. There are many people who share my – no question – radical views. So very soon Sberbank offices and Coffee House outlets will start catching fire. Same will happen to the Russian embassy, consulates and citizens. Russians are beasts and non-humans. Fungus and mold. I wonder if I should change my [Russian] surname, so that no one associates me with this dumb herd of cave-dwelling animals. Gosh the Germans chose the wrong people to burn in the ovens, yeah the wrong ones.